A few predictions for the coming year. Spark will achieve top-level project status in Apache by July; that milestone, together with inclusion in Cloudera CDH5, will validate the project’s rapid maturation. Organizations will increasingly question the value of “point solutions” for Hadoop analytics versus Spark’s integrated platform for machine learning, streaming, graph engines and fast queries. Most analytic tools can connect with Hadoop, extract data and drag it across the corporate network to a server for processing; that capability is table stakes. Few, however, can integrate directly with MapReduce for advanced analytics with little or no data movement. YARN changes the picture, however, as it enables integration of MapReduce and non-MapReduce applications. In practice, that means it will be possible to stand up co-located server-based analytics (e.g. 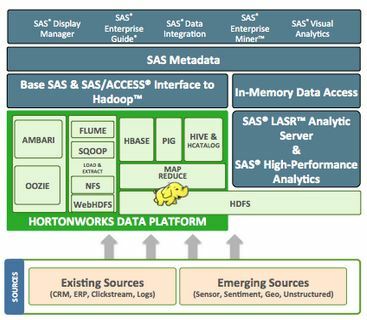 SAS) on a few nodes with expanded memory inside Hadoop. This asymmetric architecture adds some latency (since data moves from the HDFS data nodes to the analytic nodes), but not as much as when data moves outside of Hadoop entirely. For most analytic use cases, the cost of data movement will be more than offset by the improved performance of in-memory iterative processing.